It is a requirement for businesses to provide employees with proper equipment and tools to detect and prevent fire hazards. This is to protect themselves and others within the building. This includes planning evacuation procedure and determination of proper containment methods. Businesses have a legal responsibility for conducting assessment to identify potential hazards. The primary goal of this is to reduce the risk of fire hazards, therefore reducing property damage, protecting employees and the general public. Managing early detection signs and the predisposing factors of a fire ensure that you can evacuate a structure successfully and minimise any damages that may arise. The signs include smoke, unusual heat, and smells unnatural to that location. It is necessary that you have an understanding of how fire starts and spreads. One should never underestimate the harm a fire can cause. Fires are an unpredictable force, and can start for seemingly no reason at all. One of the easiest and most effective ways of early detection of a fire in your home or workplace is installing a smoke detection system or fire alarm. The first step in developing an effective fire management and detection system is examining the overall risk. The first important things you must look out for are the types and quantities of materials and substances that are in the work place or home that are likely to cause or aggravate a fire. Any explosive or flammable substances, including varnish, paint, stain, oil or petrol should be stored in a safe and secure place. There are vast arrays of devices that can help when it comes to fire detection. They include heat detectors, smoke detectors, beam detectors, ionization detectors, carbon dioxide detectors and multi-sensors. Many people become overwhelmed by the sheer amount of fittings and products available on the market. In such cases, it is advisable to hire the services of a professional fire detection and prevention company. They will advise you on the best system that suits your premise and purpose, ensuring you do not waste cash on services and devices that you do not need. These companies also provide information and guides to help in fire detection. Due to the plethora of fire-prevention and extinguishing systems and devices on the market today, it can be particularly difficult for companies that have a number of potentially toxic materials or combustible materials on site to choose the best solution one. In these cases seeking the professional help of Local Fire is the best thing you can do for the safety or your families of employees. Apart from device selection, maintenance is an ongoing issue in many workplaces. Fire detection and alarm systems may be more sensitive than you actually want them to be. This could lead to false alarms and decrease the productivity of your facilities. Under-sensitive alarms and systems are far from desired for the obvious fact that they may not detect a fire and put everyone in danger. It’s therefore necessary to ensure that your systems are regularly maintained and that a professional specialist such as Local Fire help you to select the right solution from the start. 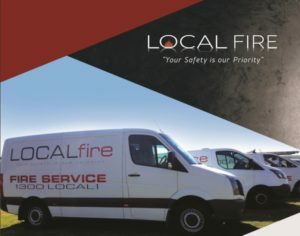 Contact Local Fire today on 02 4274 0596 to speak with one of our friendly and highly knowledgeable staff about the best fire prevention and detection solutions for your properties.